Derek Daly struggles round Kyalami during practice for the 1979 South African GP at the wheel of the distinctive, but unsuccessful Ensign N179, complete with water radiators mounted on the front of the cockpit section. From ‘Motorsport’ magazine, January 1982. From a clipping supplied by David Hodgkinson. What was the name of the Formula 1 racing driver who lived locally until his death in 1989 at the age of 82? Admittedly, he only appears to have raced in 3 major races in the 1940’s, but still, it’s not everyone that can say they raced at Goodwood race track against the likes of Sir Stirling Moss and other notable drivers of that time. Answer – his name was Fred Ashmore (1907 to 1989) and he lived for many years at Poplars Farm, Springhill, Lichfield. This proved quite a tough challenge, with which Andy Dennis wrestled admirably. Andy firstly came up with the name Morris ‘Mo’ Nunn, a local guy who operated the Ensign Racing Team, and were said to originate from Walsall Wood, before taking a second run up and getting the correct answer. Andy won a book for his efforts, and opened the door to some new historical avenues, which I invited readers to explore. What came next surprised me a great deal. I received a week or so later an absolutely huge email from reader, great friend of the blog and father of Brownhills history on the web, David Hodgkinson, with what appears to be (to my untrained eye, at least) a complete breakdown of local motorsport stories and connections. This all sits neatly with the Brian Crighton stuff from last year. In a 5,000+ word article, David has carefully transcribed magazine and newspaper clippings which he’s located in his stash, and scanned them for readers to peruse. This must have been a mammoth project, for which I’m very, very grateful. I couldn’t post them in a blog post as such, as there are far too many, but what I have done is turn them into a downloadable PDF which you can peruse at your leisure. You can download the PDF here – please do take a look. The other detail, I’ve included below with some choice snippets. I’ll let David explain. 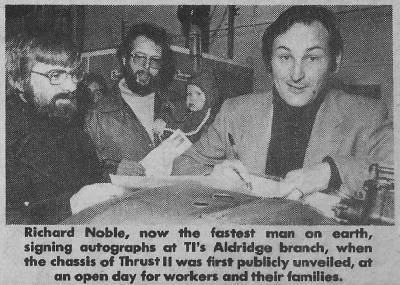 Richard Noble, now the fastest man an earth, signing autographs at Tl’s Aldridge branch, when the chassis of Trust II was first publicly unveiled, at an open day for workers and their families. Walsall Observer 7 October 1983 – Clipping supplied by David Hodgkinson. As well as the usual entertainment, your Christmas/New Year quiz has provided some answers but also some more questions. Q46: Reader Tony Winn asks: What was the name of the Formula 1 racing driver who lived locally until his death in 1989 at the age of 82? Answer – Fred Ashmore and wrong answer Mo Nunn. You have often mentioned that speculation and guesses may be interesting but are in no way History. Miss-quotes, miss-prints, lapses of memory and errors do not become true no matter how many times they are re-quoted. Mo Nunn and his Ensign team have been reported at many locations …. I can confirm that they were at what is now Queens Drive Industrial Estate, Chasetown. – Can your many readers actually verify the others? I have searched the dustier vaults of the Hodgkinson archives and found some reports of local motor sport and used them as the start of a list of motor sport activity in the area. I imagine that your readers will be able to add to it. I hope that this batch will generate a few responses of other goings on in our local area. Thanks to David for such a remarkable piece of work. If this has stirred any memories for you, or you have anything to add, please comment here or mail me on BrownhillsBob at Googlemail dot com. Cheers. By Mark Prentice – Walsall Observer 24 Jan 1986. Clipping supplied by David Hodgkinson. Click for a larger version. 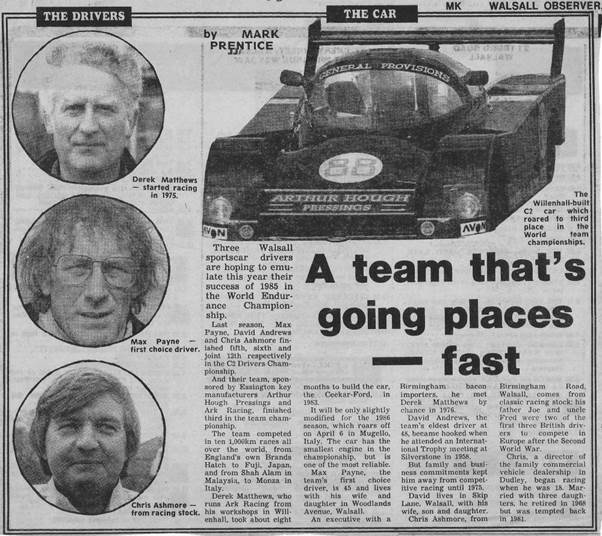 Three Walsall sportscar drivers are hoping to emulate this year their success of 1985 in the World Endurance Championship. Last season, Max Payne, David Andrews and Chris Ashmore finished fifth, sixth and joint 12th respectively in the C2 Drivers Championship. And their team, sponsored by Essington key manufacturers Arthur Hough Pressings and Ark Racing, finished third in the team championship. The team competed in ten 1,000 Km races all over the world, from England’s own Brands Hatch to Fuji, Japan, and from Shah Alma in Malaysia, to Monza in Italy. Derek Matthews, who runs Ark Racing from his workshops in Willenhall, took about eight months to build the car, the Ceekar-Ford, in 1983. It will be only slightly modified for the 1986 season, which roars off on April 6 in Mugello, Italy. The car has the smallest engine in the championship, but is one of the most reliable. Max Payne, the team’s first choice driver, is 45 and lives with his wife and daughter in Woodlands Avenue, Walsall. An executive with a Birmingham bacon importer, he met Derek Matthews by chance in 1976. David Andrews, the team’s eldest driver at 48, became hooked when he attended an International Trophy meeting at Silverstone in 1958. But family and business commitments kept him away from competitive racing until 1975. David lives in Skip Lane. Walsall. with his wife, son and daughter. Chris Ashmore, from Birmingham Road, Walsall, comes from classic racing stock: his father Joe and uncle Fred were two of the first three British drivers to compete in Europe after the Second World War. Chris, a director of the family commercial vehicle dealership in Dudley, began racing when he was 18. Married with three daughters, he retired in 1968 but was tempted back in 1981. This entry was posted in Brownhills stuff, Environment, Events, Express & Star, Followups, Fun stuff to see and do, Interesting photos, Local Blogs, Local History, Local media, News, Reader enquiries, Shared media, Shared memories, Spotted whilst browsing the web, Walsall community, Walsall Wood stuff and tagged Aldridge, Andy Dennis, Ashmore, Brownhills, Brownhills local history, Burntwood, Chase Terrace, David Hodgkinson, Ensign, Events, Express & Star, Fred, Lichfield, local blogs, Local History, New Photos, otor, Racing, Richard Noble, Shire Oak, sport, Springhill, Staffordshire, Things to do, TI, Walsall Wood. Bookmark the permalink. I can add another name to your list of local motorsport people. Neil Micklewright, born and raised in Aldridge worked for Mo Nunn on his Ensign cars. 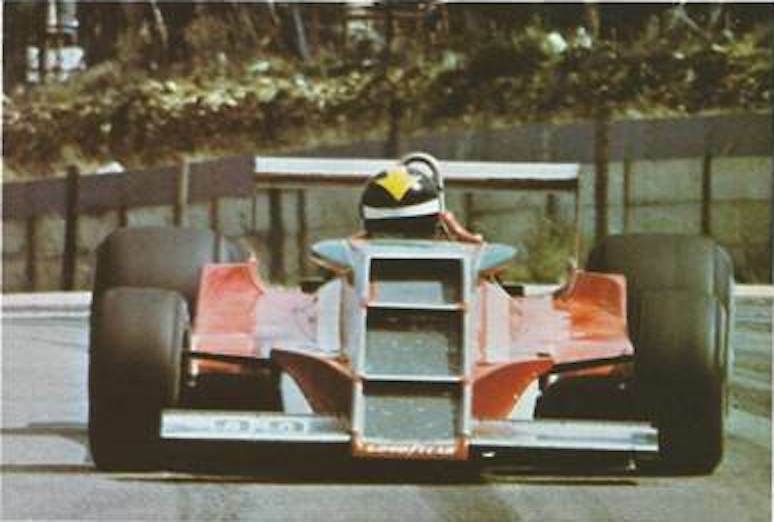 He moved to various F1 teams in the 70s including Lotus and Hesketh. From there He moved onto Indy/Champcar racing in North America. He became Vice President in charge of racing at Forsythe Racing. A fly on the wall tv documentary and DVD was made following the team. Another One for the list is Chris Guy from Burntwood a 500cc GP motorcycle racer. He raced in the late 70’s early 80’s along side Barry Sheene and Ron Haslam and company.